The room is a raw warehouse space that is partitioned off with curtains, hiding the bulk of it from view. I’m at the back of a group of girls that is nervously dropping its phones into a plastic box for safekeeping, to be returned on exit. The reason for the curtains, and the no-phone policy, is that we are about to be some of the first people outside of the Disney Imagineering group to ever see a model of the full-length and breadth of Star Wars: Galaxy’s Edge — an area coming to the company’s East and West Coast parks in the next couple of years. 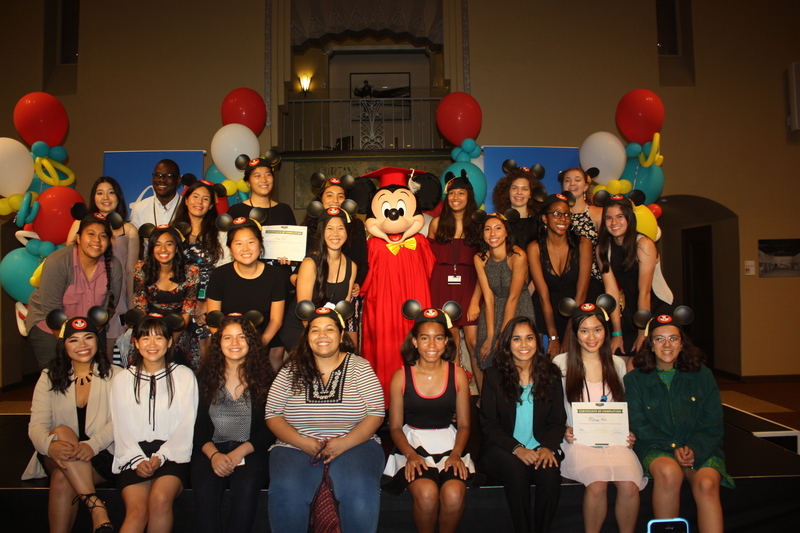 The girls are part of a Girls Who Code Summer Immersion program that Disney hosted in and around its studios in Glendale, Calif., this year. The participants, which are mostly high school girls, take coding courses with a Disney flavor and interact with executives from the company. They also take field trips like this one into the various departments of Disney’s company including Imagineering. I tagged along on one of those tours as a part of research for stories about the way Imagineering is approaching the worlds of robotics, VR, AR and more in a unique way. But today, it’s all about the big reveal. We shuffle forward on the concrete floor, parting the curtains and then we see it. 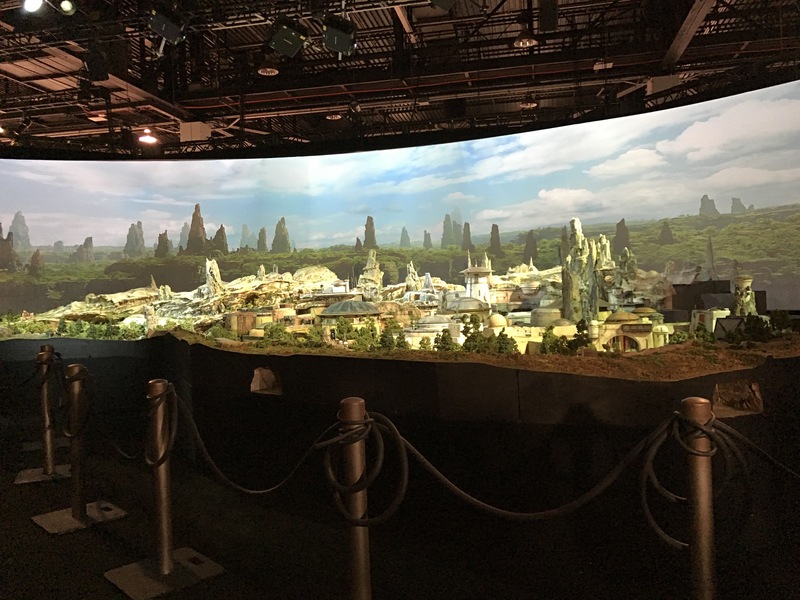 An enormous 20-plus-foot model of the announced but as-yet-unrevealed Star Wars Land. Unlike the way it’s presented a few weeks later at Disney’s D23 conference, the model is clearly shown as segments of a wooden platform that have been built up by Disney’s engineers and artists to form the backwater planet Batuu. The model is incredibly detailed, with droids, trees, decals and weathering adding life to the buildings, show structures and pathways through the rockwork. Way in the back you can see the Millennium Falcon at rest. The girls immediately start peppering Imagineers Scott Mallwitz and Margaret Kerrison with questions about the model, how it will translate to the real thing and how long it’s going to take them. The rocks that form the rear facade, for instance, will not be recreated in a computer. Instead, this physical model will be scanned and fed directly into a bar-bending machine that will create the framework to support individual chunks of facia, and the sculpting itself will get direct printed from the physical model (scaled up many times, of course). This decision came from years of Disney working out the best way to translate the three-dimensional sketches they create in these models to the theme works in the parks. From specific technical questions to broader philosophical ones, the group blasts away. The group is getting a solid picture of how the software engineering and other things they’ve been learning about in the program translate to the real physical business of building the parks. And this is just one stop on the tour. For its part, Disney clearly invests some resources into putting on the program. There is plenty of hands-on work that’s shepherded by Imagineers, executives and creatives at the company that talk to the girls and a lot of access. And not just show-and-tell access but real exposure to the technology that runs Disney’s moviemaking process, its parks and its conferences. One of the first stops was to show off a new effort that Disney is undertaking to create small semi-autonomous and interactive pods that can add life to the parks. 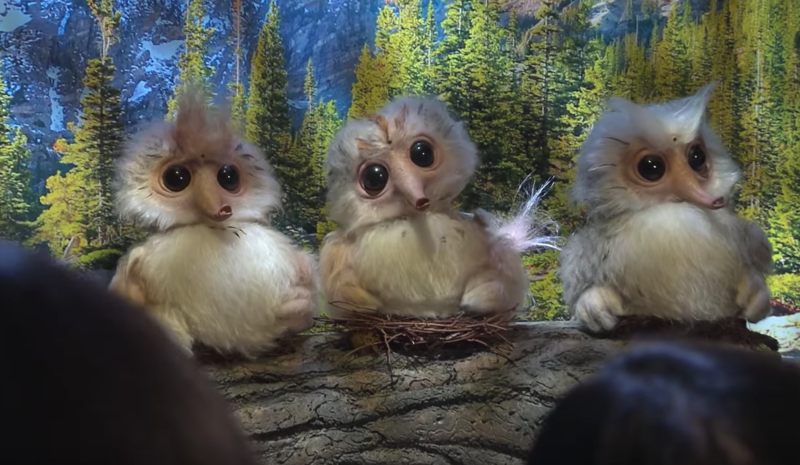 Imagineer Leslie Evans took them through the control scheme for three small creatures sitting on a log that react to visitors who talk to them. With the twist of the dial, Imagineers can change their personality, the way that they spend their time when not interacting, and just how vocal they are. 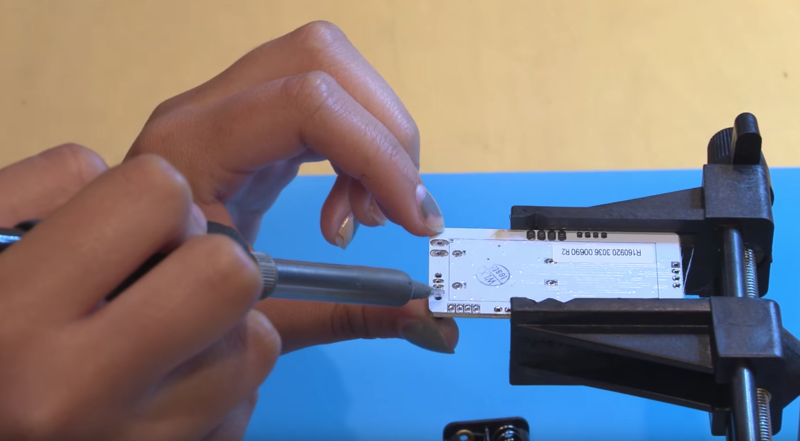 The hardware inside is a blend — as much of Disney hardware is — of off-the-shelf tech that gets the job done and bespoke parts that Disney makes itself or designs and has manufactured. The controller and the creatures are all built in-house by designers and craftspeople and programmed by software engineers. Many of those people were on hand to talk to the Girls Who Code participants and to help them understand how you get from the lines of code they work with to these real, tangible things. “I already expected the girls to be brilliant, but was surprised by how much they grew over the course of a seven-week period. To see each of them start with little-to-no knowledge of computer science, and end the program creating mobile apps, websites and VR experiences was absolutely amazing,” said Sarah Tilley, VP, Tech Talent Management and Talent Acquisition. I also reached out to some of the participants in the program and they seemed pretty pleased with the way it turned out. Megan said that the Disney interactions were key to making the program feel special. At one point during the day, the girls were escorted into a multi-purpose room used for Imagineering briefings and taught how to solder together their own version of Disney’s networked infrared controllers. These are used in the light-up elements of Disney’s California Adventure, including wands, ears and World of Color accessories. They wirelessly communicate via IR bursts and are programmed via an iPad with an internal-only app called Ear Jockey. The whole system was up and running in the lab for them to play with and was explained by Imagineers. When they were done, they had a small white unit that they could take into the parks and watch activate right alongside the other systems running there. I asked one participant what she thought of the soldering project. She found it fun and compared it positively to an experience she had recently putting together circuit boards for satellites. This, though, was much more immediate and fun, she said, because she got to see the result working right away. It seemed to me that the practical lessons of application really hit home. Girls Who Code is a national non-profit that works to close the gender gap in STEM and technology. Disney is a huge multinational corporation that can only benefit from more girls and women wanting to enter these fields. There was a unique opportunity here for a company like Disney to illustrate the cause and effect that code can have on the physical world. But it’s not alone and I’d hope to see other companies link up with Girls Who Code for these kinds of programs. O’Day says that Disney works closely with Girls Who Code in developing a curriculum that makes the opportunities available to students who pursue STEM education very clear. And then illustrates them with Disney experiences. Another experience was a trip inside The Dish. This is a curved chamber inside a nondescript Disney building that houses multiple incredibly high resolution projectors that functions, most simply, as a holodeck. 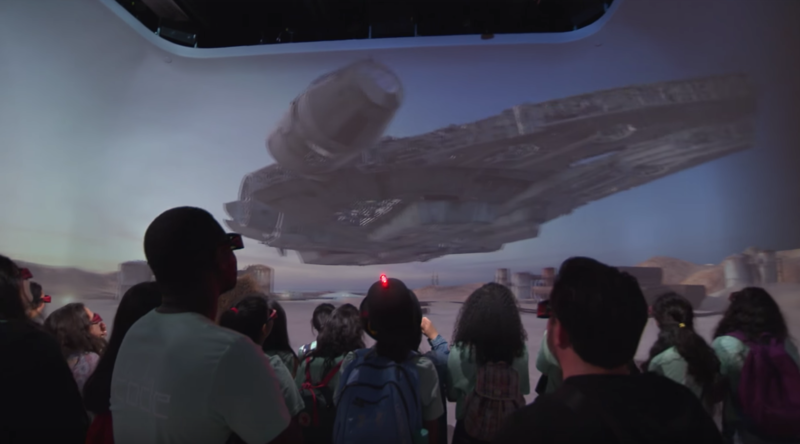 Disney uses it to visualize rides and VR experiences. The girls got to don the master ‘Bowler Hat’ that tracks their movements and walk around inside a space that changed and shifted to perfectly match their perspective. It’s a great example of existing systems that have been bent to Disney’s specific purposes and a great way to show off how writing lines of code can result in a transformative experience on the other end. I asked whether the speakers and experiences they got at Disney changed how they thought about using code. Megan Naji says that she’s now planning to major in computer science as a result of the program. “One hundred percent! Before attending this program I never even considered a future in coding. I did not think I was a very techie person but that was primarily because I had never had the opportunity to try to be,” she says. These kinds of reactions, in my experience, are far from rare when you open up access to STEM education early and in an engaging way.